The latest Chesterfield magistrates’ court results as published in the August 31 edition of the Derbyshire Times are listed below. Robert Newton, 60, of Belvedere Avenue, Chesterfield. Found guilty of assault by beating. Fined £150 and must pay £50 compensation and a £30 victim surcharge and £620 costs. Nathan Patrick Rackham, 26, of Springfield View, Ripley. Pleaded guilty to assault by beating. Community order to last until August 21, 2018, with a Rehabilitation Activity Requirement and 100 hours of unpaid work. Must pay an £85 victim surcharge and £500 costs. Daniel Keith Cooke, 32, of No Fixed Abode. Pleaded guilty to assaulting a police constable in the execution of his duty. Committed to prison for two weeks consecutively to a previously imposed sentence of 22 weeks. Must pay £50 compensation, a £115 victim surcharge and £85 costs. Stephen Brian Blewitt, 33, of No Fixed Abode. Admitted failing to comply with supervision requirements imposed following release from imprisonment by failing to meet a probation officer. Indicated a guilty plea to contacting someone at a certain address which he was prohibited from doing by a restraining order. Must pay a £115 victim surcharge. Committed to prison for seven days. Martin James Powell, 36, of No Fixed Abode. Failed to comply with the supervision requirements imposed following release from imprisonment. Committed to prison for 14 days. Luke Anthony Twigg, 24, of Calow Lane, Hasland, Chesterfield. Admitted failing to comply with a community requirement of a suspended sentence order. No adjudication. Dealt with for the original offence which was subject to the suspended sentence order of visiting his parents’ property and asking for money and to be let in when he was prohibited from doing this by a restraining order. Suspended sentence of 12 weeks imprisonment suspended for 24 months to be implemented. Indicated a guilty plea to stealing bank cards. Indicated a guilty plea to a further count of stealing bank cards. Indicated a guilty plea to six counts of fraud by making a false representation namely using a stolen bank card to make a gain. Indicated a guilty plea to stealing a Stihl Saw valued at £500. Must pay £49.25, £29.19. £29, £29.25 and £500 in compensation. Committed to prison for 24 weeks. Peter Thomas Greene, 33, of Hardwick Drive, Chesterfield. Pleaded guilty to damaging a door, lock and window belonging to Waterloo Housing Association. Fined £80 and must pay £100 compensation, a £30 victim surcharge and £85 costs. Paul Leslie Ayres, 41, of Green Farm Close, Chesterfield. Pleaded guilty to stealing two bottles of Southern Comfort belonging to Tesco Metro. Pleaded guilty to using threatening behaviour. Admitted committing an offence while subject to a 12 month conditional discharge for a theft. No adjudication. Pleaded guilty to failing to surrender to custody. Dealt with for an original offence which was subject to a suspended sentence order of stealing a bottle of Southern Comfort valued at £20 belonging to Tesco Metro. Pleaded guilty to stealing a bottle of Russian Standard vodka and a bottle of Jack Daniels whiskey valued at £39.50 belonging to Tesco. Must pay £39.50 compensation. Committed to prison for 26 weeks. Ryan Ian Wells, 27, of Vicarage Croft, Rowsley, Matlock. Admitted failing to comply with a community requirement of a suspended sentence order for failing to attend with a probation officer. Fined £120 and must pay £60 costs. David Maurice Shaw, 50, of Penncroft Drive, Danesmoor, Chesterfield. Pleaded guilty to having a vehicle registered under his name which did not meet insurance requirements. Fined £143 and must pay a £30 victim surcharge and £100 costs. Roy Bradley, 52, of Holme Hall Crescent, Holme Hall, Chesterfield. Pleaded guilty to exceeding the alcohol drink-drive limit. Fined £440 and must pay a £44 victim surcharge and £85 costs. Disqualified from driving for 38 months. Leon Tony Jackson, 40, of Welgrove Road, Chesterfield. Pleaded guilty to using a vehicle without insurance. No separate penalty. Pleaded guilty to driving while disqualified. Fined £40 and must pay an £85 victim surcharge and £85 costs. Community order to last until August 23, 2018, with a Rehabilitation Activity Requirement. Disqualified from driving for six months. 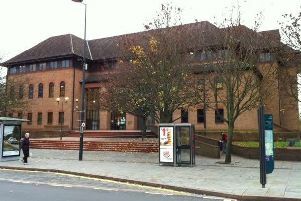 Paul William Gill, 45, of John Street, Clay Cross. Pleaded guilty driving while disqualified from holding or obtaining a driving licence. Pleaded guilty to using a vehicle without insurance. Fined £370 and must pay a £115 victim surcharge and £620 costs. Pleaded guilty to failing to stop a vehicle when required to do so by a police officer. Fined £330. Pleaded guilty to failing to provide a urine specimen when suspected of having driven a vehicle and in the course of an investigation into whether he had committed an offence. Pleaded guilty to being the driver of a vehicle owing to the presence of which an accident occurred whereby damage was caused to another vehicle and failed to stop and give details. Committed to prison for 24 weeks suspended for 12 months with an Alcohol Treatment Requirement and a Rehabilitation Activity Requirement. Disqualified from driving for two years. Pleaded guilty to driving without due care and attention. No separate penalty. Eva Sloka, 23, of Derby Road, Chesterfield. Indicated a guilty plea to stealing clothing valued at £111.92 belonging to TK Maxx in Chesterfield. Fined £80 and must pay an £85 victim surcharge and £85 costs. Convicted for stealing a Nikon SLS camera, a blue Diesel bag, a Calvin Klein bag, a Ted Baker purse, two bank cards and a number of store cards. Community order to last until August 23, 2018, with a Drug Rehabilitation Requirement and a Rehabilitation Activity Requirement. Must pay £83 costs.